Powered watercraft are available only for research and academic activities. We do not rent powered watercraft for recreational use. Step 1. Eligibility – you must be a current Juniata student or employee to rent RFS watercraft. We have many persons using these boats so reservations are required. Please contact rfs@juniata.edu to reserve boats. Canoes and kayaks are located by the shed, which is along the road past the lodges. Some canoes are stored next to the road, while others are stored part way down the path to the lake. The path to the lake starts next to the storage shed. RFS Does not provide car racks. If you are planning to use the boat off site, please bring your own straps and racks. Life jackets and paddles are stored in the shed. The RFS staff will unlock the boats and equipment shed for you. Please list on the white board all user names, your departure time, planned return time and where you plan to paddle so that we know when and where to come looking for you if you get into difficulty. You must wear a life jacket (zipped up and buckled) while using RFS watercraft. When finished, please return the life jackets and paddles to the shed. Wet life jackets can be dried in the shed. The watercraft should be returned to the place that you found it. The launching area is NOT a no-wake zone. 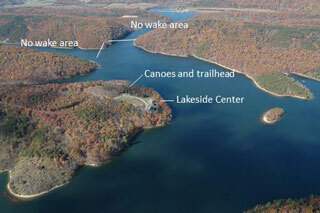 We recommend you paddle across the lake to one of the no-wake zones (see map below). RFS Canoes and Kayaks must be off of the water BEFORE sunset. After sunset, Fish and Boat Commission regulations require all watercraft to have running lights.